PennsylvAsia: "Whose Narrative? Re-Examining War Memorials In East Asia And The U.S," April 4 at Pitt. "Whose Narrative? 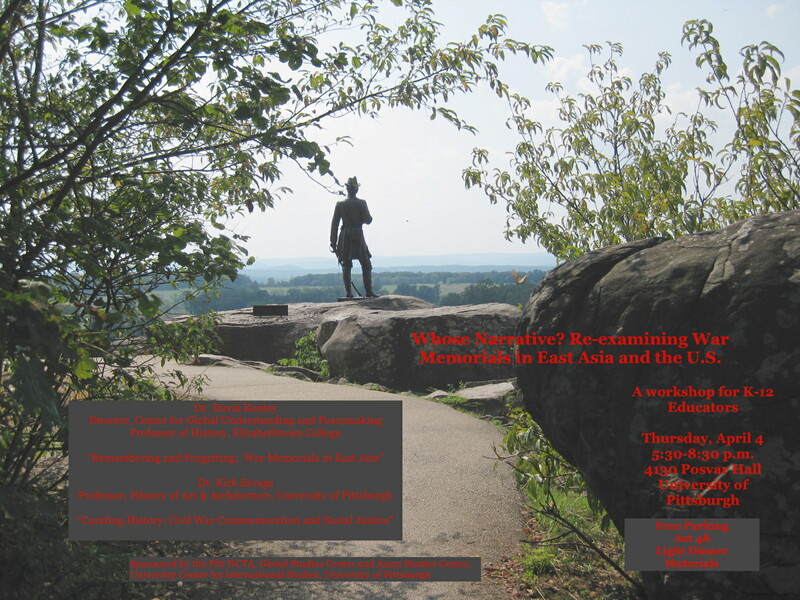 Re-Examining War Memorials In East Asia And The U.S," April 4 at Pitt. The University of Pittsburgh's Center for International Studies will host "Whose Narrative? Re-Examining War Memorials In East Asia And The U.S" on April 4. Intended as a workshop to foster critical thinking skills, this program will feature presentations by two scholars who work on similar issues in entirely different parts of the world. Dr. David Kenley (Elizabethtown College, PA) will speak on “Remembering and Forgetting: War Memorials in East Asia” with a particular focus on WWII memorials. Dr. Kirk Savage (University of Pittsburgh) will talk about “Curating History: Civil War Commemoration and Social Justice.” The program will include Q&A with the speakers. Attendees will receive Act 48 (if Pennsylvania teachers), dinner, free parking, and materials. The event runs from 5:30 to 8:00 pm, and registration is required.